The guest bedroom is often over looked as the ‘everything’ room. Things get thrown in the room that is not used everyday and can often be forgotten. Having a guest bedroom is a luxury, and should be treated like any other room in the home. Whether you have family or friends coming to stay, creating a beautifully styled room to make your guests feel at home is important. The bed linen is the perfect starting point for your guest bedroom and in terms of colour, you want the guest room to be neutral but without being too plain and or beige. I consider navy and deep greens as neutrals as much as greys and white. 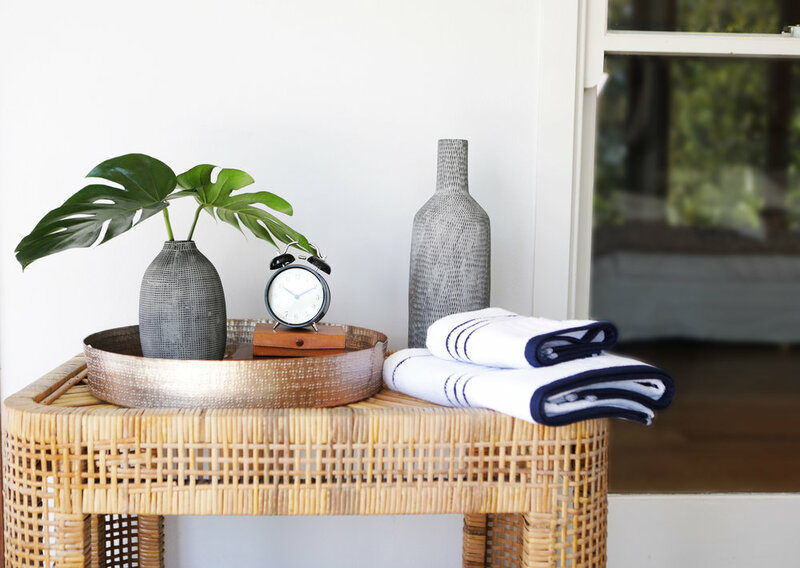 The look I created for My Domaine was American classic meets relaxed Australian luxury. The TH academy quilt cover set in Navy is the perfect starting point to build and layer upon. Navy works perfectly with green, red, and any other shades of blue, as we used with a simple ticking stripe in sky blue. The simple TH embossed logo adds a subtle texture. Building upon this tonal base, injecting accessories in brass, jute and timber adds texture and layers to a monochromatic scheme without being too overly bold. You want to create a sense of calm within the room while at the same time creating enough interest and intrigue within the interior. If you anything like me, and have a compete obsession with throw cushions, the rule is the more the merrier. Scatter cushions allow you to layer the bedding and add interesting graphics and motifs that work back with your scheme. Accent furniture such as an armchair in the corner of the room with a side table, and a commode or console allows your guests to have somewhere put there belongings and brings a touch of ‘hotel’ to the room. Artwork hanging above the bed or console allows you to inject personality into the room and should always work back with the tone and style of the room you are creating. Small styling details are the finishing touches such as fresh cut flowers, scented candles and beautiful fresh bathroom towels. The Tommy Hilfiger Home collection is available from Myer and David Jones. Check out the story online at My Domaine.